We’re urging tortoise owners to microchip their escape-prone pets in a bid to reduce the number which end up in rescue centres every year. They may seem unlikely escapees, but hundreds of the reptiles go missing across the county every year. Tracking down the owners can then prove extremely difficult if the animals aren’t microchipped. We had a recent visit from Susie the tortoise, who escaped twice from her home despite her owners trying to ‘tortoise-proof’ their garden. Vet Chrissy Kleespies implanted a mini microchip – which is smaller than a grain of rice – in Susie’s leg, meaning she can now be identified should she find her way out again. Emma Blackman, practice manager at our Basildon branch, is encouraging other owners to follow suit. She said: “When Susie came in we suggested she should be chipped because she’d escaped a couple of times, despite the garden being tortoise-proofed. “We hear lots of stories of tortoises being found in other people’s gardens, but because they’re not microchipped, they don’t know who they belong to. Jane Williams, founder of tortoise husbandry and welfare specialists Tortoise South East, deals with dozens of calls each year from owners whose pets have gone missing. Jane said the animals often turn up in unusual places, with one recently being found at the side of the busy A11 dual carriageway. She said: “It’s very difficult for most people to identify their tortoises if they go missing, and without microchipping it is virtually impossible to prove one is yours. 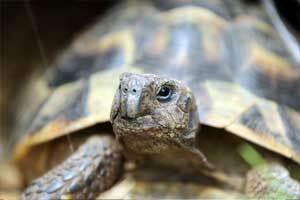 “Every year we’re contacted by frantic owners who have lost their tortoise. They have a stronger attachment to them than you might imagine, as some have been passed down over two or three generations. To help tackle the issue, we’re offering a tortoise health check and chip with Chrissy during September for £45. Included in the fee is a 20-minute appointment, a health check, a chip (providing your tortoise is appropriate size) and advice on tortoise husbandry and hibernation. For more information on microchipping, contact Cherrydown Vets on 01268 533636. For more information on Tortoise South East, visit www.tortoisesoutheast.co.uk.